On a rainy autumn evening, if there’s one thing most people can agree on, it’s that there’s nothing like a big pot of pasta, soup, or chili to make the night perfect. I have a great turkey chili recipe HERE, and it’s a simple, delicious meal for a cool evening. And I have lots of soup recipes, which you can see right here. 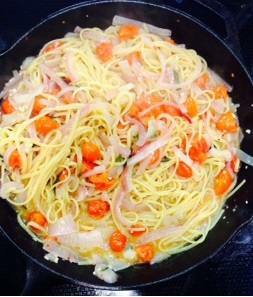 And recently I dug through my refrigerator to find some ingredients for a meatless pasta dish. I had some eggplant from the farmers market, some cubed butternut squash from the grocery store, and plenty of garlic and onion, which I always keep on hand. I hope you like it, too. It’s easy and has that powerful flavor payoff that we’re all looking for, honestly. Who wants to eat something that was quick to make that ends up being a flavorless failure? No one, obviously. 😉 Check out the recipe for this simple pasta dish, and enjoy all the flavors and the creamy texture it provides. 2. Add garlic, red pepper flakes, tomatoes and mushrooms, and saute for another three minutes or so. 3. Add the ricotta, and stir gently as it melts into the vegetable mixture. Again, if moisture is needed, add pasta water or broth. 4. Add cooked pasta (I used rotini, but other short pastas would work well: ziti, shells, elbows, penne, etc.) to the vegetables in the Dutch oven, and gently fold in. 5. Serve in a big bowl, and top with grated Parmesan cheese. Enjoy! Tip: A great time saver that I often use and have mentioned several times is to cook up a batch of pasta on your days off, drained and with olive oil stirred in to coat the pasta to prevent sticking. Pour into gallon ziplock bags and store in the fridge to use during the week. Saves so much time later. 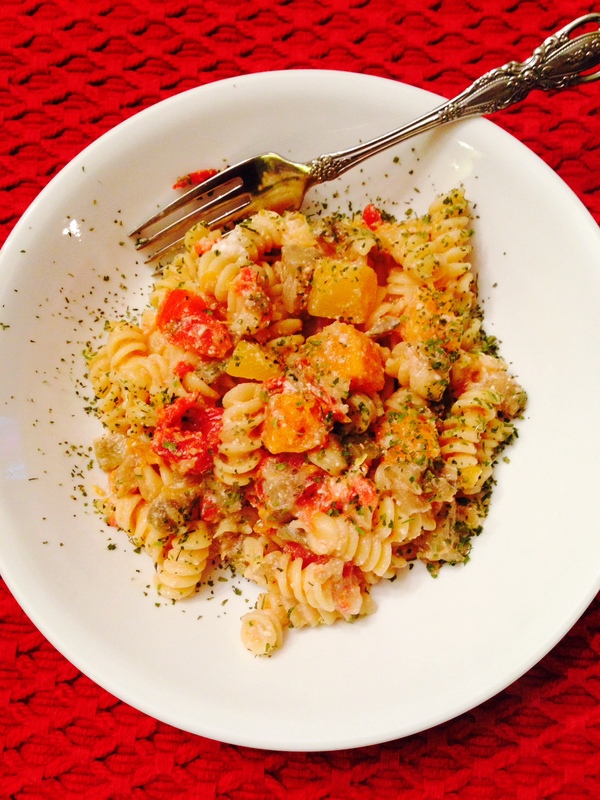 Or try this one-pan pasta, as the pasta cooks right in the pan with the vegetables, and takes on great flavor as it does: Mama Steph’s one pan spicy tomato pasta. I hope you stay safe and dry tonight, wherever you are!